After our report that the app economy is starting to mature last year, we started getting a lot of questions from members and friends about where the app economy is going. For this post we crunched through millions of new iOS and Android apps released over the years to look at 10 important questions and the data behind the answers. Are App Stores Still Growing? Starting with one of the questions we field most often — growth. To answer this question, let’s look at the number of apps available for download at the end of every year for the past few years. Both Apple’s App Store and Google Play were growing consistently all the way up to 2017, when they split. Google Play continued to grow at a pretty good rate of about 30% to more than 3.6 million apps. Apple’s App Store however, headed in a very different direction. It shrunk. At the end of 2017 there were roughly 2.1 million iOS apps available in the App Store, a decrease of 5% when compared to the 2.2 million apps that were available in the beginning of the year. The decline is a result of stricter enforcement of Apple’s review guidelines, as well as a technical change that eliminated many old apps that were not updated to support 64-bit architecture. How Many New Apps Are Released Every Year? Apple’s willingness to shrink its store in favor of better quality, while admirable, is not the only reason for the decrease. Let’s take a look at how many new apps are released every year. These include apps that were released and available on the store for at least one day. Android developers kept busy, and in the last year alone released more than 1.5 million new apps. This is an increase of about 17% year over year, the largest jump since 2014. iOS developers on the other hand, took their time releasing just 755k new apps in 2017. That’s a big drop! 29% to be precise, the first drop since the App Store launched in 2008. Are Apps Being Ported Between Platforms? One last contribution to growth is apps being ported from one platform to the other. Porting an app, in case you’re not familiar with the term, refers to taking an app that was built for one platform and building it to run on a different platform. 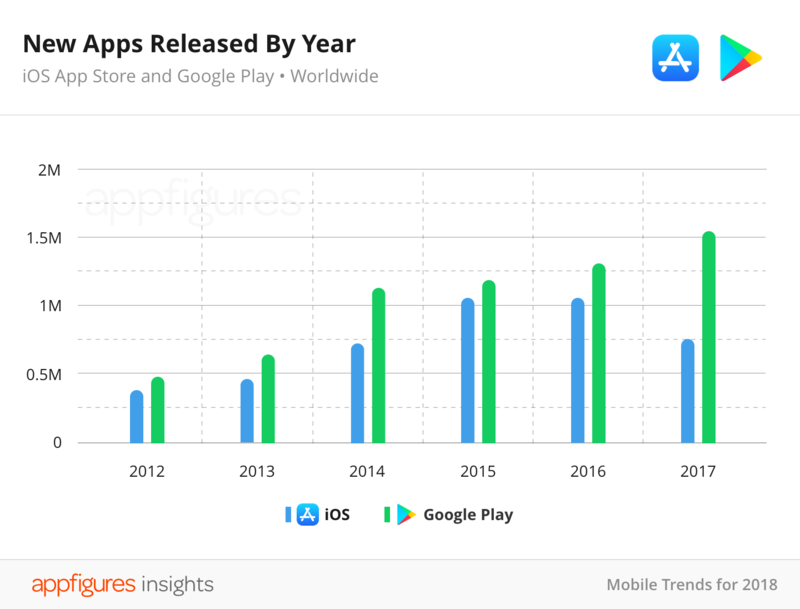 For this chart we looked at the number of apps that were released in 2017 that had already existed on a different platform before. Yes! Although ~25k apps isn’t that big of a number, this does show developers are crossing the platform barrier and extending their apps beyond the original release. Again, Google Play is winning the race. 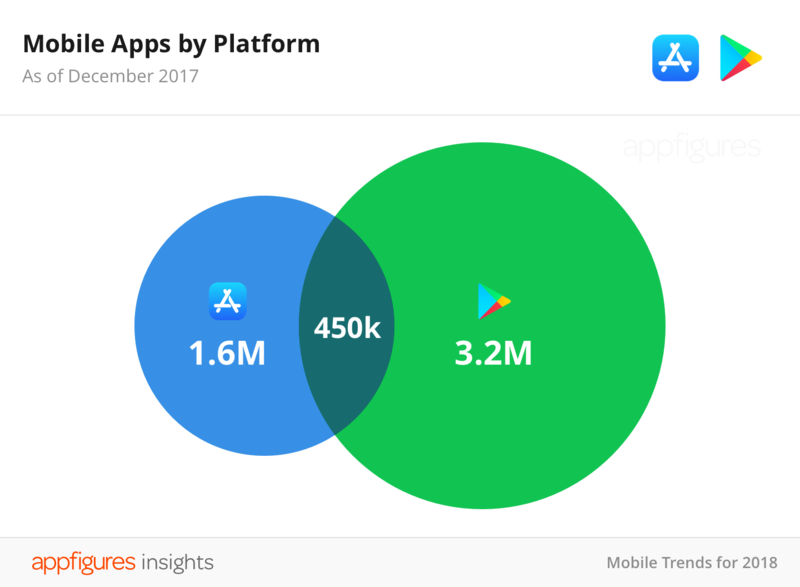 More than twice as many iOS apps came to Android in 2017 than Android apps came into the App Store. How Many Apps Are Cross-Platform? The chart above shows the number of apps that were ported, and this chart shows the number of apps that are currently available by store and how big the overlap is. According to our algorithm that maps apps cross platforms, roughly 450k apps are available for both iOS and Android. This is a fairly decent amount, but when we look at the bigger picture, it amounts to just 8.5%. Building and maintaining an app for multiple platforms can be a real burden, especially for indie developers and small teams. Which Non-Native Tools Are Most Apps Made With? Talking about cross-platform development, another common set of questions we often get has to do with non-native app development — which means using a 3rd party tool to build apps that can then be published to multiple platforms with little to no code changes. There are quite a few tools that enable that, and using our SDK data we zoomed in on apps that used those tools. 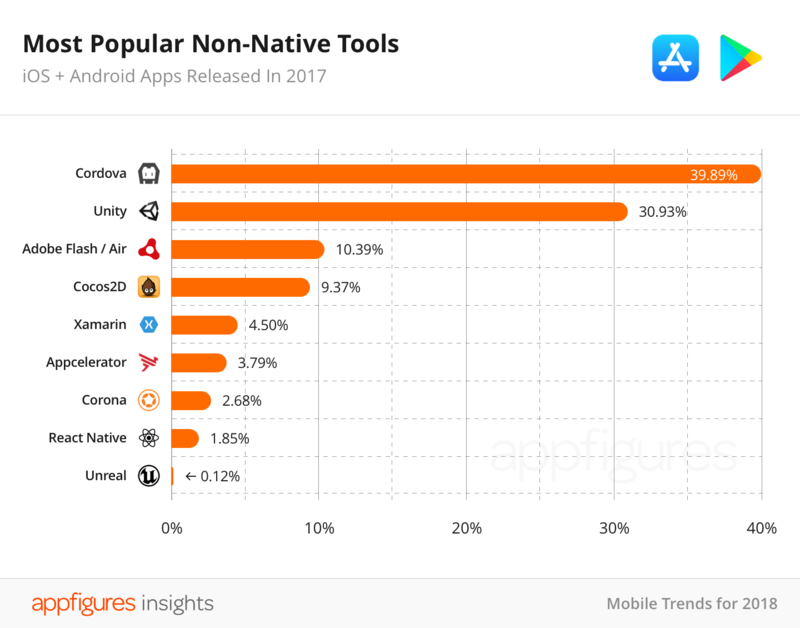 Here are the most popular non-native app development tools. Cordova and Unity are what most app developers use to build their non-native apps and games respectively. React Native, a framework we use and love here at Appfigures, is slowly climbing up the list. We’re really looking forward to seeing how developers will take to it in 2018. Side note: We’re always surprised to see new apps being shipped with Adobe Flash/Air. Not just because of the sour relationship Adobe has with Apple but also because Adobe announced Flash will be killed in the next couple of years. Is Non-Native Development Really Taking Over? Those are pretty interesting numbers. There’s actually a common misconception that more and more apps are being developed using non-native tools so they can be deployed to multiple platforms easily. According to our data, that’s not the case. To prove that, we looked at all iOS and Android apps released in 2016 and 2017, and compared the ones that used one of the non-native tools listed above with ones that didn’t. Not only is the number of non-native apps relatively small, year-over-year that number went down across both platform. Apple and Google have made native app development simpler over the last few years by introducing more modern programming languages and continuing to enhance their frameworks. That seems to be working! Which Countries Are Shipping The Most Apps? Last year we started collecting location data for app developers (which helped the GSMA compile its annual Mobile Connectivity Index), so we have a pretty good understanding where developers are located. We combined that with app release data to see which countries are producing the most apps in 2017. 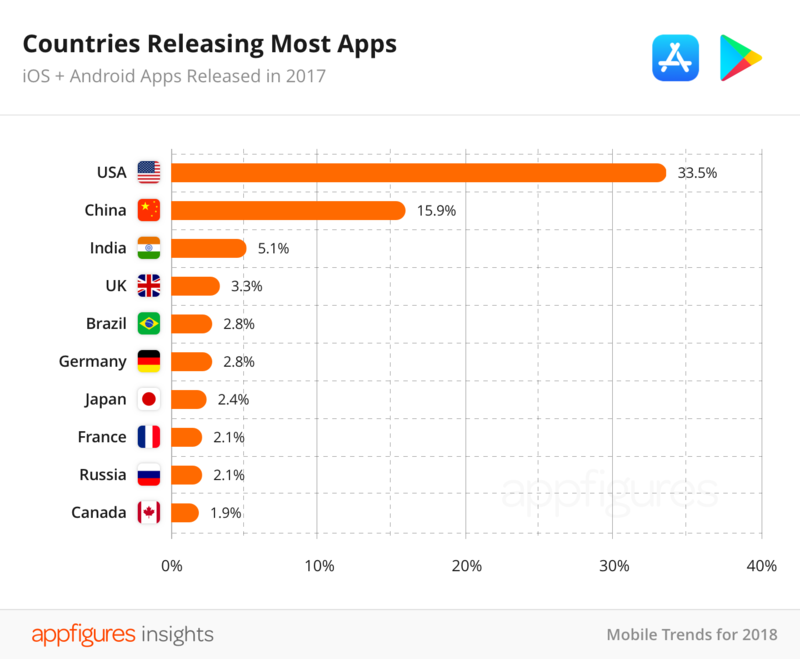 The top 10 countries on this list are responsible for roughly 75% of all new apps released in 2017. 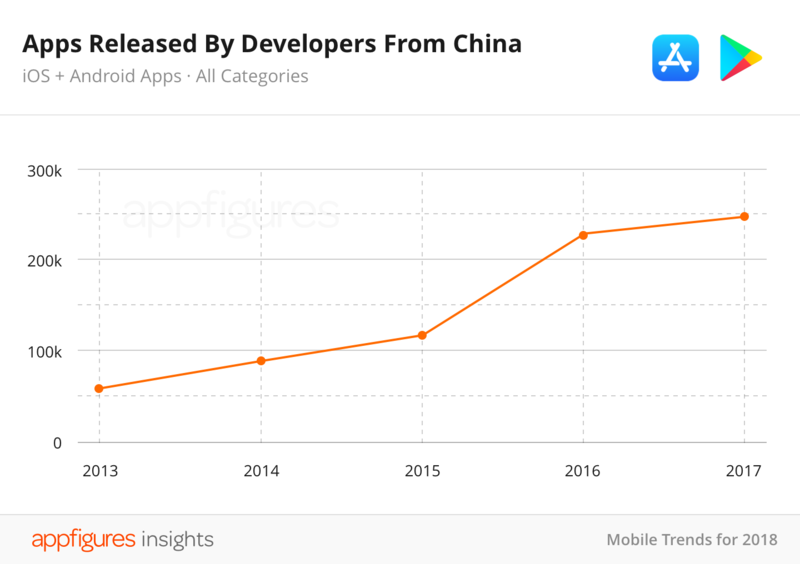 While developers in the U.S. continued to release more apps, China–the only other country with a double digit share–continued its persistent climb. How Fast Is China’s Developer Community Growing? There’s always talk about China, so for this question we’ve charted the number of iOS and Android apps released by developers that are located in China. It’s going up! App developers based in China are continuing to push out more apps year over year. Although 2017 did not see as many new apps as 2016, this consistency indicates healthy growth. Which Types Of Apps Are Developers Making? To wrap it all up, let’s answer the last and most obvious question — Which categories are getting the most apps. 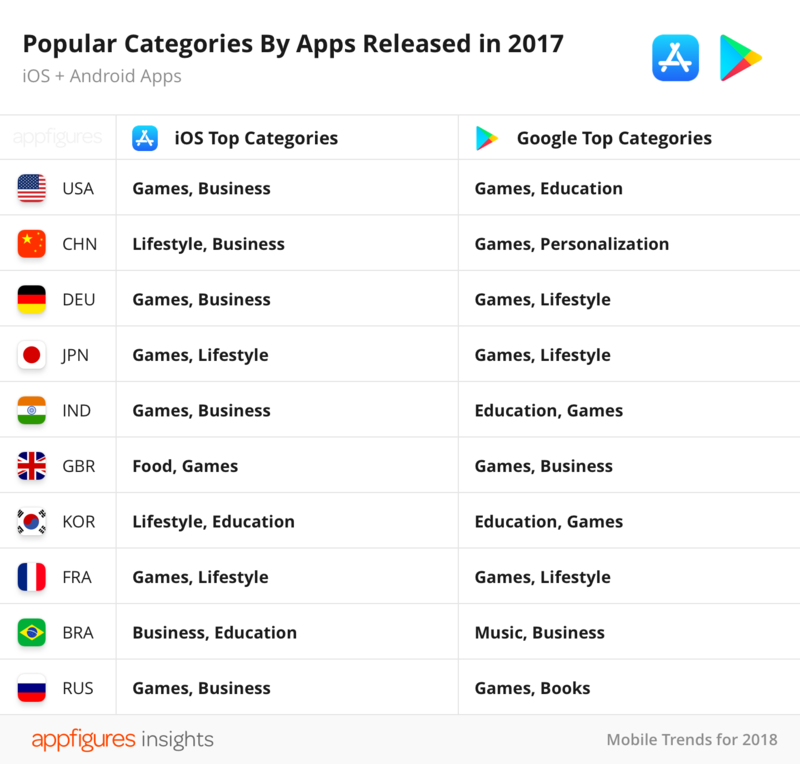 As you might have guessed, games is one of the most popular categories and sees the most new apps. That explains why Apple recently made Games into a top-level category in the App Store and also why Google followed suit just last week. Games aside, the Business, Lifestyle, and Education categories also saw a busy year across the globe. We expect this trend to continue growing. Have a question that we didn’t answer? Ask it in the comments below or get in touch directly and we’ll do our best to answer it with our data. Non-native apps refer to any app that uses one of the SDKs mentioned in the report. Although they each go about development in a different way, they all offer a way to develop an app/game without needing the platform’s main language. We determine which SDKs apps use by downloading them and then poking inside their binary files — a process that allows us to determine which SDKs are installed in the app. This means non-native apps include apps that rely on one of those SDKs fully or partially. We analyze all free iOS and Android apps, as well as popular paid apps available for download in the US. Data for these SDKs as well as many others is available directly in Explorer. 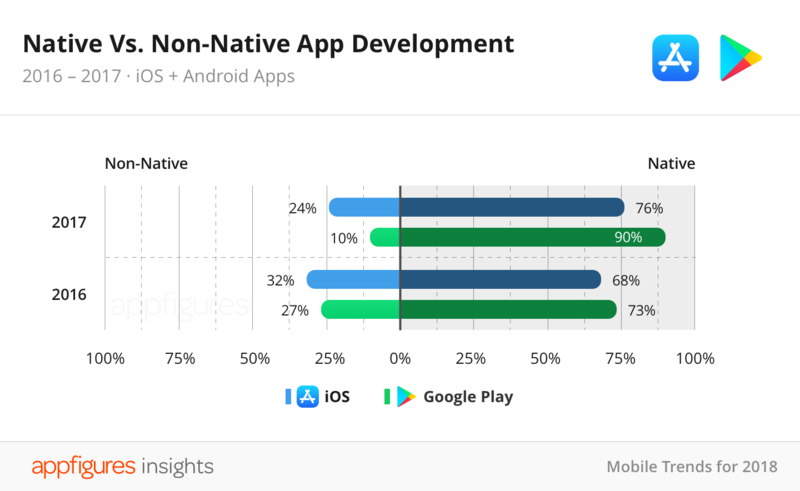 Hi, regarding this analysis, I’m very surprised about the Native vs Non Native App development. Did you consider on Native language only the Platform languages as Swift or Kotlin or there is languages like React Native inside the Native App ? React Native is on the list of non-native tech, so I’m assuming that isn’t in the native numbers. I’m a little surprised the the relatively small number React Native has. Hopefully it doesn’t rise, and dies a slow agonizing death. what surprised me, is the fact that Cordova is not dead yet! And in fact it’s the number 1 non-native framework used. React Native is really far down on the list despite it being discussed very often in the mobile app development field. That makes sense, considering non-native frameworks are on the decline, but as you, I’m still surprised to see such low numbers of adoption. Our analysis considers apps that use one of those non-native SDKs, meaning any apps that’s using a 3rd party SDK for development, like React Native, is considered non-native. If only these charts could be filtered for just profitable (from the developer’s perspective) apps. Well you are never going to get that data as it’s not stored anywhere. I’d estimate 1% of titles are profitable. Very useful data, thanks. I would still love to see both stores implement a per app submission fee of say around $50-$100 to help cut down on the sheer number of submissions. There are still too many reskins and clones of clones drowning out innovative titles from indies who spend thousands of hours in their games only to be swallowed in a sea of low effort titles. Adobe announced the end of life in 2020 for the Flash Player browser plugin specifically. AIR is a related product, certainly, but Adobe has stated to developers that AIR was not included in that announcement. I think it would be interesting (and more practical) to adjust the per-country data to population, as its obvious a country of 325M people (USA) makes much more apps then UK for example, with ~65M people. In this report we were more interested in showing where the growth came from. The adjusted approach makes sense for reports that give more insight for the entire distribution, something we plan on reporting on in more depth in the future. Also, Apple doesn’t allow 2 versions, ‘Free’ and ‘Paid’, of each app, that they strictly started enforcing a year or 2 ago. They require developers to have one version you can upgrade with In-App Purchasing, which may decrease the number of apps in comparison. That’s probably true. Apple’s crackdowns in 2017 were pretty severe. Great suggestion! We’ll check out NativeScript and include it in the analysis (if it’s popular enough) in followup reports. That’s definitely something we’re planning to explorer in a separate report. In the mean time, a cursory look shows several hundreds of thousands of games using Unity or Cocos2d, and there are roughly 3x games built with Unity vs Cocos2d. Keep an eye on the blog (or subscribe to our mailing list) to get this report when we publish it. That’s pretty conclusive. I’m not even sure how an Apple apologist could spin this, but they will. They’ll think of something. Ehh, stats are rarely conclusive, and can be spun to say anything regardless of your position. When you apply the proper context to these stats in particular, it doesn’t seem like Apple is doing bad at all. What an excellent apology for Apple. And pointless personal attack. Grats. the dunning-kruger runs rampant. 3.6 million Android apps and 2.1 million iOS apps is absurd. 99.9 percent of these have to be complete garbage. I wonder how the data about native vs non-native is collected. It seems React Native has a very small market share but then it’s used in apps that aren’t 100% React Native but contain native code alongside. I would imagine those apps then fall into the native category? If the app uses React Native at all, we consider it non-native. It’s said that you poke into the binaries to see what SDK they are using. With these binaries, do you tell if the app is native (using apple/google SDK), and if it doesn’t then it’s considered non native, or the other way around, you have pattern for each non native SDK, and if an app doesn’t use one of these patterns it’s considered native ? If that’s the second answer, what about app that are developed with non native SDK that you might not have pattern to recognize (like Kony), do you place them in Native or Non native ? We use a white-list approach, meaning when we detect one of the SDKs we outlined in the report we count the app as non-native while everything else we call native. We looked at other non-native SDKs for this report, but they were just too small so we didn’t include them. This is interesting because apps built with Xamarin are native, you can not distinguish the binary. Once the app is compiled you cant tell anymore if it was built with Xamarin. On Android their use the native android tools and similarly on iOS. How are you able to distinguish apps built with Xamarin from the native apps? While they compile to native code, Xamarin uses its own frameworks for many thing. Those get compiled into the app as well, and we scan for their signature. It was left out because the number of apps using it was small in comparison to other SDKs in the category. My understanding is, one of the reasons native is used more is for performance reasons. non-native isn’t there yet, and often doesn’t have the most cutting edge tech. My company tried Corona when we first delved into app dev, and there were several issues where certain features wouldn’t work on one half of the platform, or would be quirky. For us, it was the death of 1,000 cuts. We went native, and haven’t looked back. 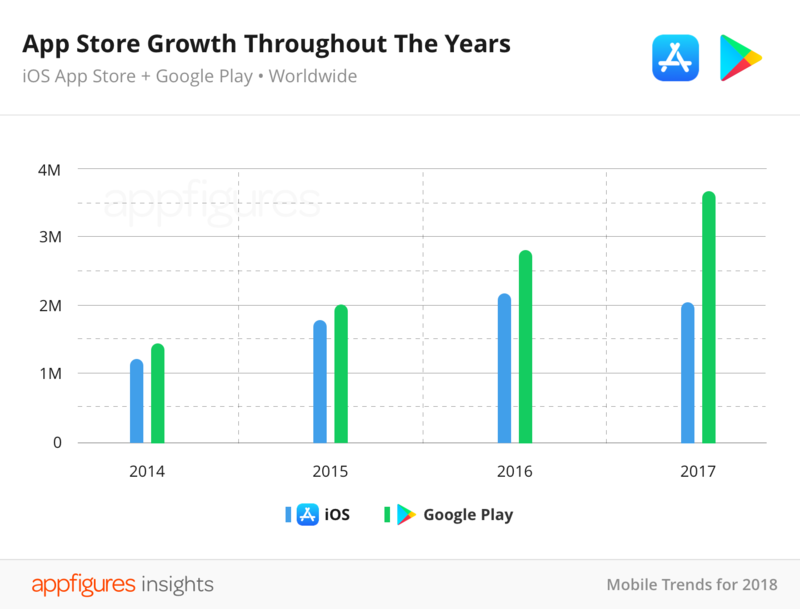 As for the play/app store comparison: one thing to add to put those numbers in perspective is that Google largely does not regulate or even review the apps you put on their store. Lots of sub par, glitchy, and/or outright sketchy garbage apps make it out there. So shady companies can swarm apps onto the store to try to score quick bucks through ads, or data mining. Despite that, I love Android as a platform, and I am really excited to try Kotlin(Java is so clunky), as I am loving Swift so far. Much as I find Apple’s submission process frustrating and sometimes outright unfair, I feel it has a better ecosystem as a result. Good point regarding performance. That said, not all of these SDKs are alike in how they approach non-native, which is most likely also a factor in their adoption. I’d like to see insights into monetization models (in-app purchase, ads, subscriptions or upfront fixed price). Thanks for the suggestion Fabio. We’ll be diving into that in the future, so keep an eye on the blog or join the mailing list. Because while Flash Player is scheduled to be killed at 2020, Adobe still pushes AIR Runtime to target Mobile and Desktop platform with minimum code changes. Chinese developers are getting busy making apps on WeChat and Alipay, the meta-apps, which may explain the slight decrease in app release last year in China.